Gov. 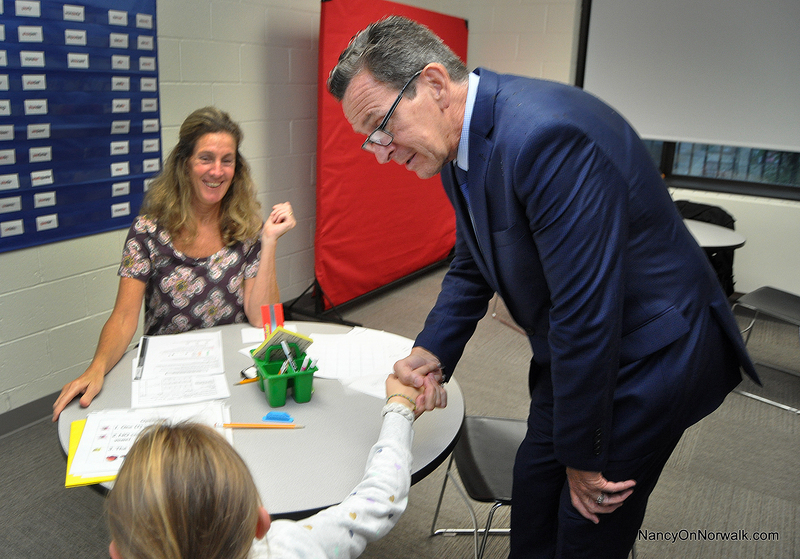 Dannel Malloy greets a child Tuesday in the Norwalk Center for Specialized Learning in Literacy as instructor Eileen Maddafari looks on. Norwalk Board of Education Chairman Mike Barbis gets his hearing tested Tuesday in the Norwalk Center for Specialized Learning in Literacy. NORWALK, Conn. – Norwalk on Tuesday celebrated the first public school dyslexia clinic in Connecticut, according to Norwalk Public Schools Chief of Specialized Learning and Student Services Yvette Goorevitch. Starring in the grand opening of the Norwalk Center for Literacy was Gov. Dannel Malloy, who, after assisting in a ribbon cutting, told two children inside that he had overcome challenges similar to theirs’, and that if they hang in there they’ll be fine. 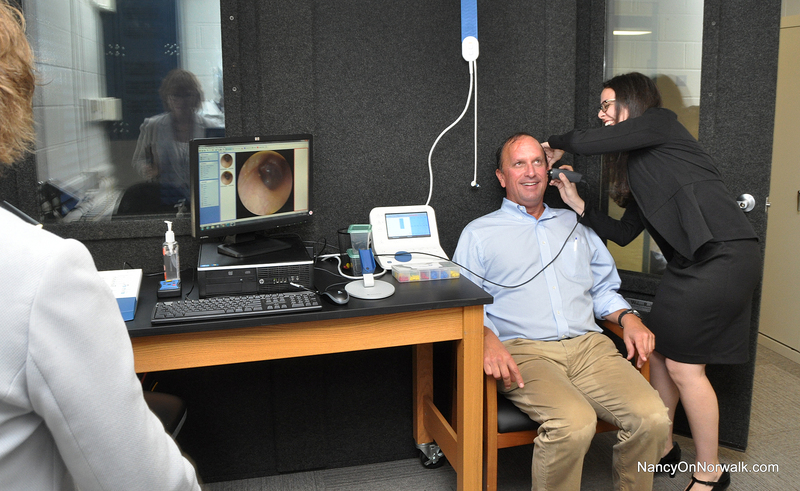 The free clinic, on what was the Briggs High School site at 350 Main Ave., features an audiology testing lab and has been building capacity for a year, Goorevitch said. Funding for the clinic came from the Special Education transitional fund established two years ago, with $4.2 million from the City-side of the budget and $2.1 million from the Board of Education side. The fund is intended to create in-house SpEd services to reduce outplacements. Goorevitch said the dyslexia facility was Norwalk Superintendent of Schools Steven Adamowski’s vision, and one of the major incentives for her to come work in Norwalk. “Dr. Adamowski’s dream becomes a reality today. Quite simply, the goal of the Norwalk Center for Literacy is to eliminate illiteracy in our community,” she said. The traditional phonetic approach to reading instruction doesn’t work on children diagnosed with dyslexia, Adamowski said Tuesday. He explained that 60 percent of Connecticut’s children are classified learning disabled and most of them are given that classification because of reading problems. 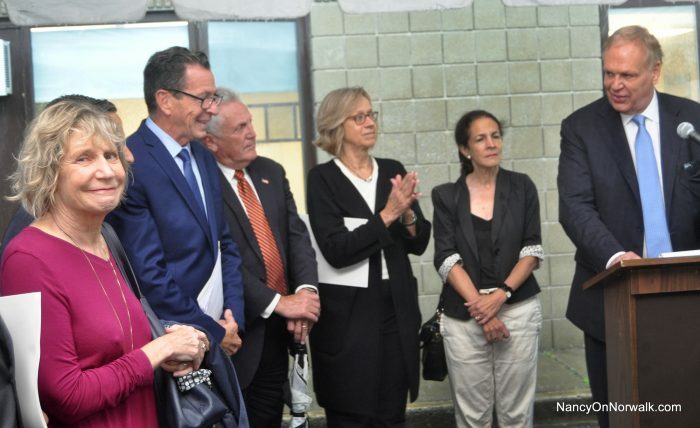 Marking the opening of Norwalk Center for Specialized Learning in Literacy during a heavy rain storm Tuesday are Norwalk Superintendent of Schools Steven Adamowski, right, and Gov. Dannel Malloy, second from left. Former Board of Education member Sue Haynie helped inspire the clinic by relaying the struggle she and her son faced in getting him the services he needed, Adamowski said. He also relayed appreciation to Mayor Harry Rilling and Common Council member Greg Burnett (D-At Large) for helping to authorize the SpEd fund. At the time Burnett served as Board of Estimate and Taxation Chairman. Children of color are disproportionately not identified as dyslexic and then disproportionately incarcerated because “they have not have had the series of interventions that are identified here,” Malloy said. “Once again, we are leading the way,” Rilling said, after a ribbon cutting. 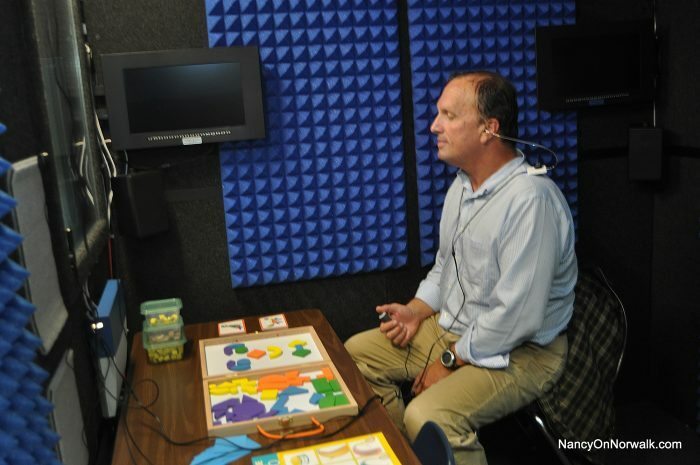 Norwalk Board of Education Chairman Mike Barbis has his ear canals examined Tuesday at the Norwalk Center for Specialized Learning in Literacy. Wonderful to see Norwalk PS take the lead in this endeavor-the only public dyslexic clinic in Connecticut. Kudos to Superintendent Adamoski and SPED Director Goorevitch for tenacity and the BOE and City for funding. The center’s research and design team from Fairfield U and Haskins Lab are world-class and cutting edge. Hopefully the clinic will get the funding to expand and become a regional hub for dyslexia intervention and staff training. I have two kids with dyslexia. Fifteen years ago, it cost me about $100,000/per kid and 5 years to get them the services they needed to learn to read. I was able to buy my children’s way out of illiteracy. That this level of dyslexia intervention is available to Norwalk children, many who have parents who could never ‘buy’ their way out, is truly transformational. Congratulations! You have worked tirelessly on this for your children and the children of Norwalk. Having an administration that is responsive is so rewarding, and our students will benefit tremendously. I remember when NPS and Fairfield University launched the Center for Specialized Learning in Literacy, a training program for dyslexia intervention. I knew, after many disappointments and battles, that we were on our way to helping many parents of all backgrounds, including minorities, who have struggled for so long to get help and proper diagnosis. The grassroots organization Decoding Dyslexia has also been a force with which to be reckoned. I attended a Dyslexia conference at the Water’s Edge Inn and Resort in Westbrook where Governor Malloy spoke a couple of years ago. I was inspired by his story and his compassion to support dyslexic children. Kudos to Sue for also being a driving force in getting dyslexia testing the place it deserves in our school system and for giving up a lot of her time to share needed information and resources with parents who needed the guidance. I’ve always appreciated her helping me to help many of them. She was always more than willing. •Should there be a breaking out or a co-existing relationship between Special Education and STE (School of Teacher Education) since many general education or non-special education teachers are not trained to deal with special education? •It shouldn’t be a “their kids” situation, but an “our kids” situation – one district/one budget. •Special education being the step child of education seems to be a cultural issue and there are good points made on each side of the argument of whether or not special education should be funded out. I admire people who can listen to both sides of an issue and not let their ego or overt politics get in the way of making good decisions. I’m glad there were and are passionate people on the side of securing funding for Special Education and that Norwalk is leading the way in the state. Kudos! I’m puzzled by this quote: “He explained that 60 percent of Connecticut’s children are classified learning disabled and most of them are given that classification because of reading problems.” Sixty percent of the children in CT are LD? That just doesn’t sound like a correct figure. Could you please clarify? @Tina Engberg, I think what’s missing is, 60% of “special education” children are classified as learning disabled. Reading failure is oftentimes the main issue. For SPED children, about 34%+/- are classified as ‘specific learning disabled’; this is the category where most dyslexia kids are placed. About 18%/- of SPED kids are classified with a speech/language disability (SLD). A large % of SLD kids are in PreK-1st grade. Early problems with speech and language are a red flag for dyslexia and other reading disabilities. SLD kids are very often ‘re-classified’ to another category when they get a little older. About 18% of SPED kids are classified with ‘Other Health Impairment’. This is a very broad category but it includes kids with ADHD and kids with both ADHD & dyslexia (the most pronounced disability is how the classification is determined). So proud of those who stood up and brought this program to bear. Thank you! A great day for our students in Norwalk. So happy and thrilled that we had the support of Sue Haynie and administration. I personally learned how to advocate for my own kids through Sue’s tireless efforts to help her own kids . I have witnessed for myself how the right kind of intervention for kids with dyslexia caught early in their education can change their life in ways that we will never understand. I have two children with severe dyslexia and the laws for each were different. For the younger one, dyslexia was found in grade 1 and had tested out of sped in middle school, Now taking honors courses in HS. My oldest is in college and still struggles but had the support of unbelievable compassionate regular ed and special ed. teachers and an amazing guidance support staff at NHS. Because of Sue, I didn’t listen to the ones that said it couldn’t be done. Illiteracy is not option for anyone. Norwalk has stepped up to the plate and is not only making a difference in my own kids lives but the lives of my students. Thank you Sue for all that you taught me and I hold you and your kids close to my heart. To administration, thank you for supporting and making this endeavor a reality!